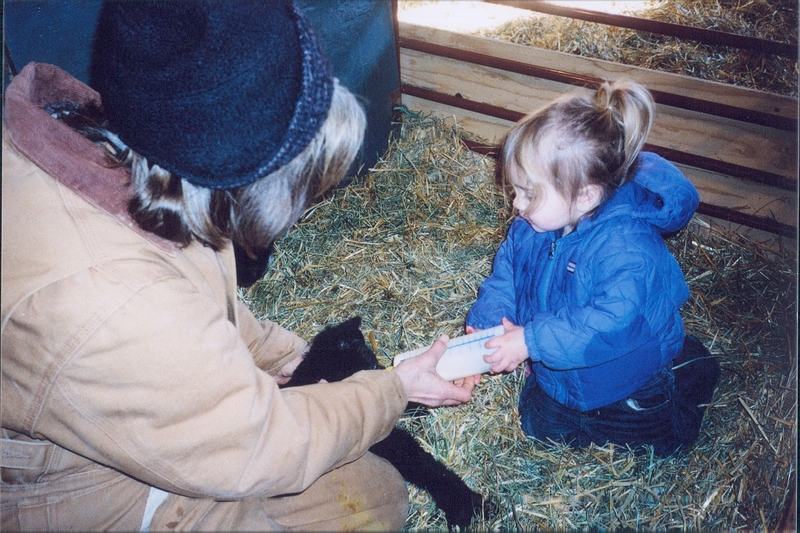 Lizbeth and Stephen Shafer got our first sheep in 1980 with the support and encouragement of Lizbeth’s family, who farmed in Dutchess County NY. 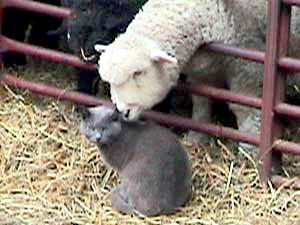 Our first ewes, not purebred, had been the subjects of the shearing demo at the NYS Sheep and Wool Festival. 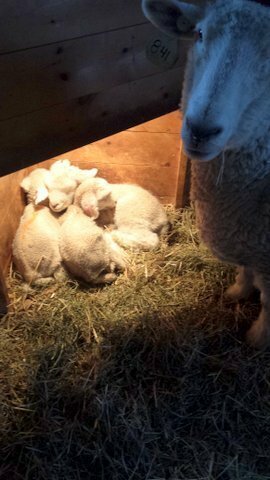 At Wethersfield, the farm in Amenia NY founded in the 1930s by Lizbeth’s father, we began a very small Romney flock the next year. 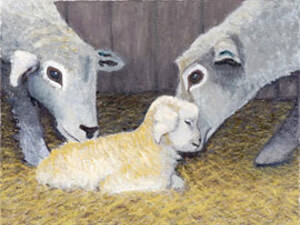 The first three ewes came from Brenda Bothe (NJ) ; the first ram, from Peter and Patty Drape (NY). 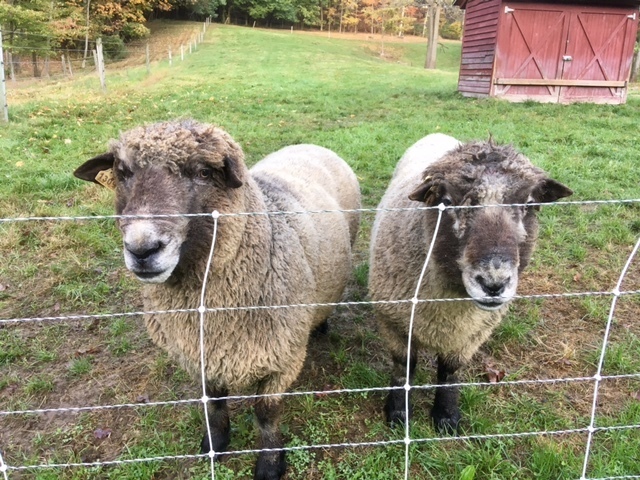 With the very material assistance of our friends the Blundells and of the Wethersfield Farm staff we built up the Wethersfield Romney flock along with a fair-sized commercial-sheep operation. 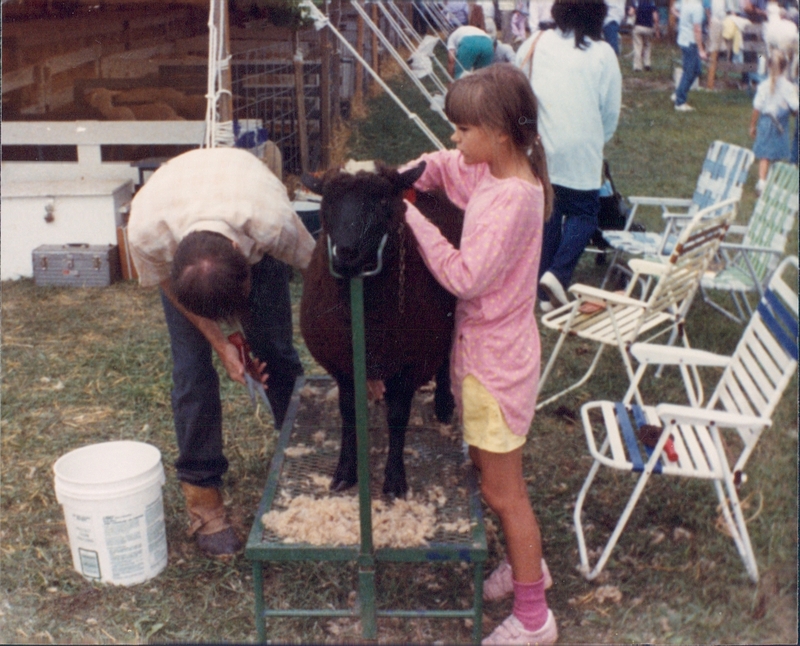 Wethersfield Romneys got Premier Exhibitor at the Big E in 1987 and 1988; Premier Breeder in 1988. 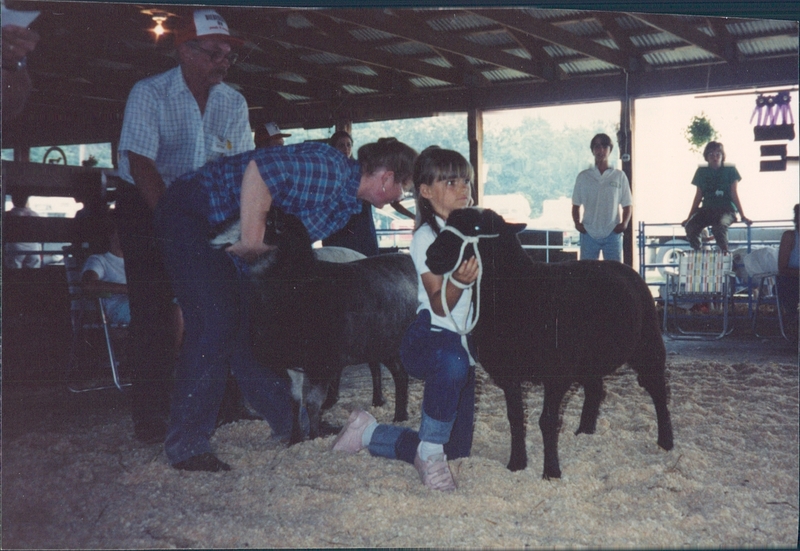 At NAILE in 1988 Wethersfield had Grand Ch. 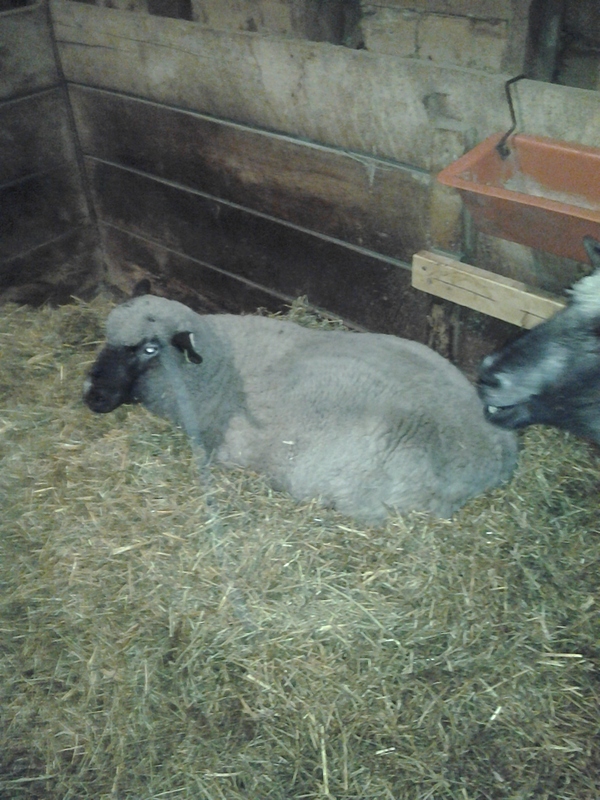 Romney Ewe (If I remember right, she was a Bellairs.) Thus for 30 years this flock has stood well at major eastern shows; see the Shows and Sales pages for details. 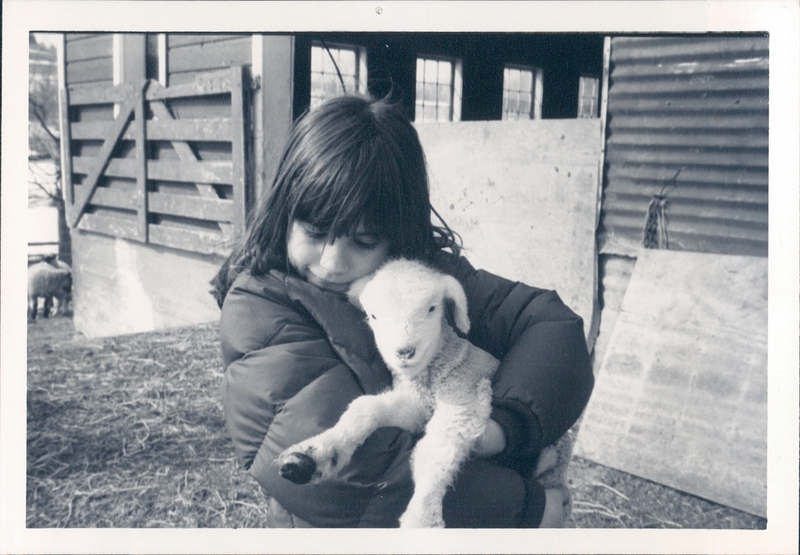 In 1992 we moved to a 250-year-old farm in Saugerties, NY and changed the flock name to Anchorage, that having been the name of the new place since the 1890s. The move and the re-establishment could not have been done without the expertise of Randy Reuter, manager 1989-2000. Ian Stewart lent a strong hand 2002-2003. In 2004 we were privileged to have Graeme Stewart come as manager. 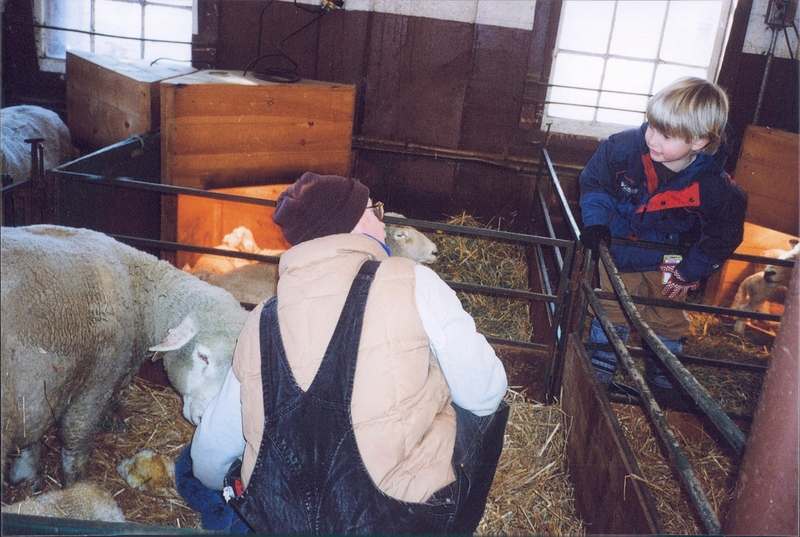 Not only is Graeme indispensable to Anchorage, but he also has had many roles in the Dutchess County Sheep and and Wool Growers Association (of which –no surprise–Lizbeth’s brother in law Roy had been one of the original organizers). 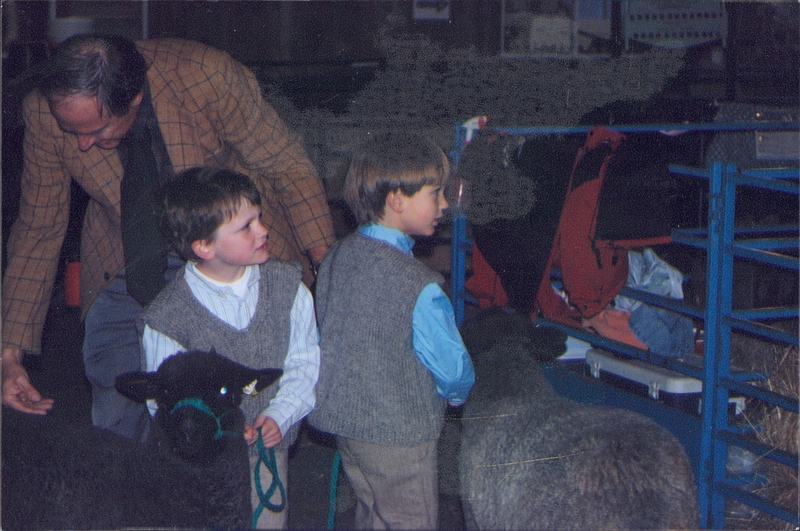 Several years ago, Graeme was named Shepherd of the Year by the Association . 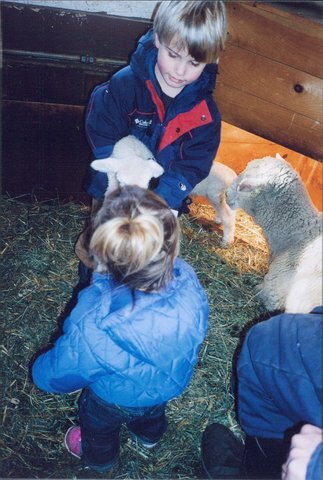 He judges sheep shows in MA, MD, NJ, NY, PA, VT and OH. Our farm was cleared before 1763 by settlers of Dutch descent. In the 19th C. it was known as “The Brink Place” for Capt. John Brink, who fought at Yorktown and whose son Andrew piloted the North River Steamboat (later called Clermont) on its maiden voyage to Albany in 1809. On moving in we found a lot of old horse-drawn farm equipment from the early 20th C. and before. The barns had no electricity and no water except a seasonal spring. 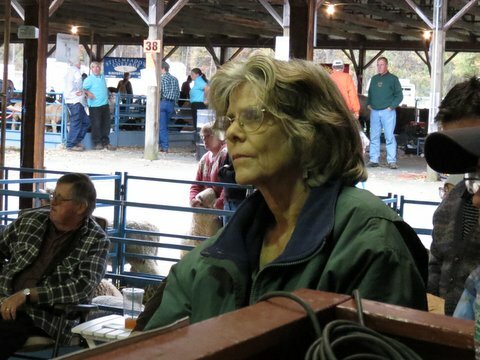 The slideshow takes viewers through four seasons at Anchorage Farm today. In 2014 we had to put down 19-year old Zephyr, the gray cat who is seen in some of the slide pictures. 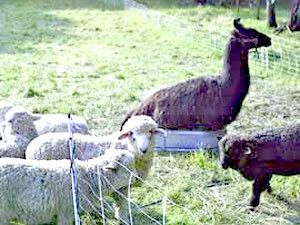 In 2015 Lava the guardian black llama had to be put down at age 14. He, too, appears in some of the slides. 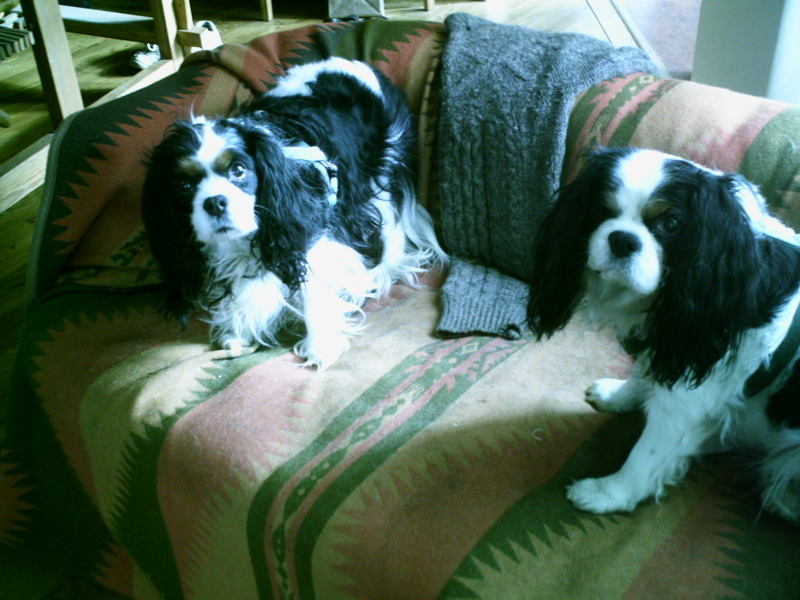 Daniel the tricolor cavalier spaniel who’s in one of the slides, died a few years ago. 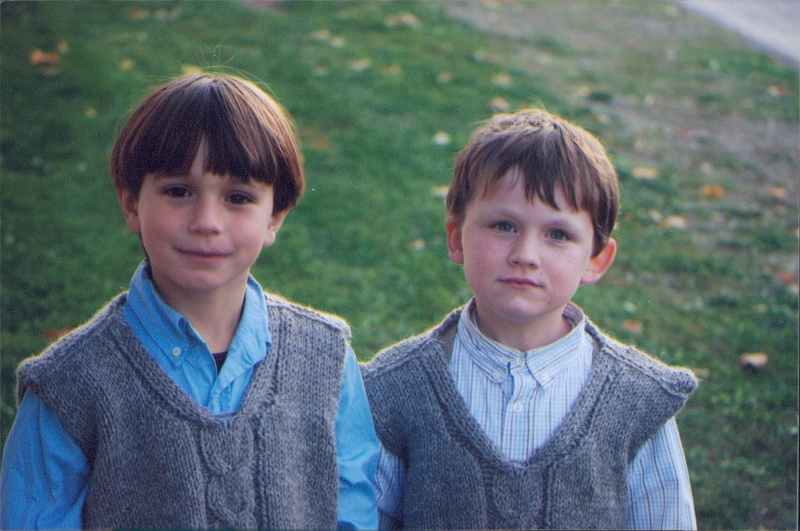 and this year so did Jali at age 13, leaving Felix (5). Graeme has Nash the cream golden. None of these dogs does a lick of work on the farm, of course, but they grace our households. In 2017 we described management this way, with an overture to “carbon farming:” Skip this if you like, go to 2018 below. 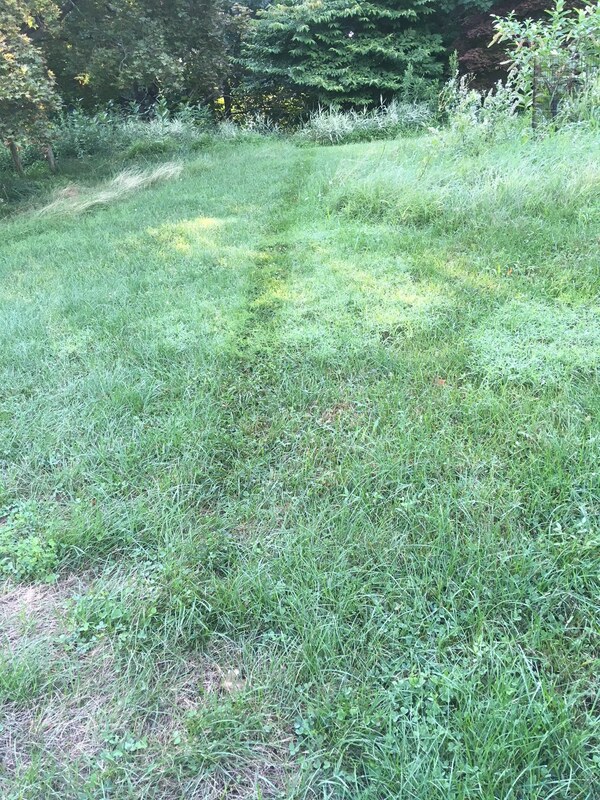 We run about 13 acres of perennial pasture, mostly rolling with one steeper hillsides. 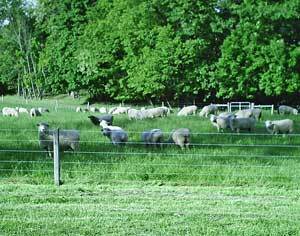 We use semi-intensive rotational grazing for the ewe flock until breeding season, when subgroups stay in larger paddocks longer. We fertilize the more level swards with long-stockpiled barn bedding waste. 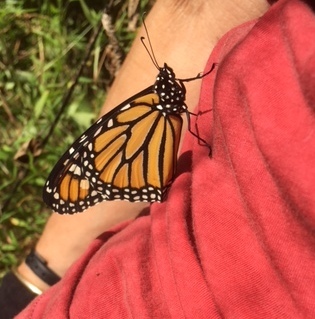 We don’t employ chemical herbicides for reasons like the one to your right: this monarch had just emerged when photographed on Sept 30 2018. We do use chemical wormers regularly as appropriate to age and breeding cycle. 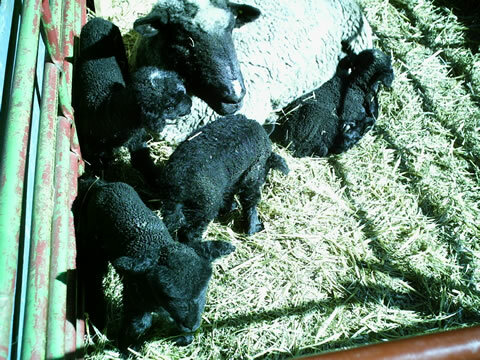 Mature ewes are vaccinated against Vibrio. 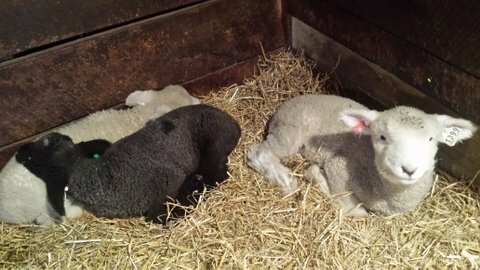 Lambs get lasalocid in their feed to one year of age for control of “coccidiosis.” Other antimicrobials by mouth or injection are given as needed for treatment of symptoms or prophylaxis against threats like neonatal pneumonia or chlamydia-caused abortion. A few years ago we used 4-3-3 by Amsoil as a foliar spray mixed with liquid lime on the two main pastures for two years, but have not applied anything except barn compost in the last five years. The liquid lime kept getting stuck in the sprayer nozzles. 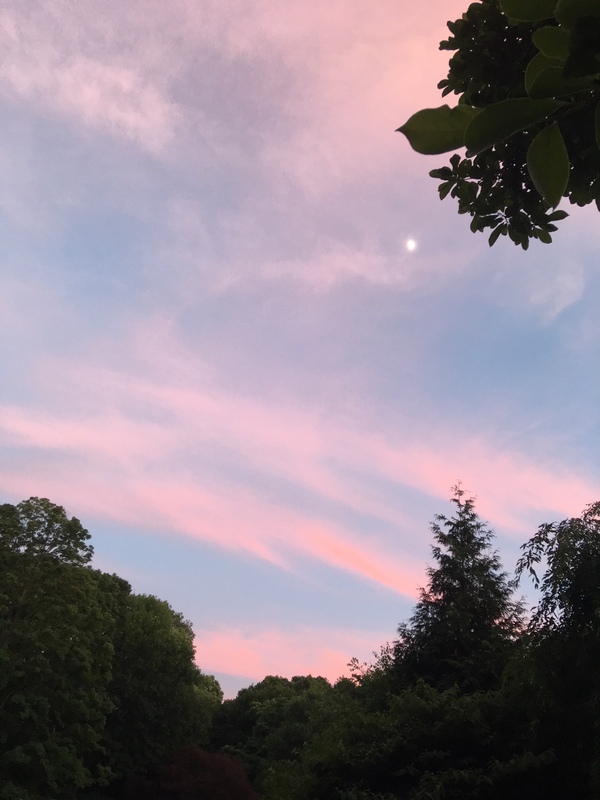 Assessing our farm’s current carbon footprint (C-print) using our own tabulations as well as USDA COMET-farm; the English counterpart Farm Carbon Calculator; and the Scottish Coolfarm Tool. Lowering the C-print immediately We now buy electricity for the barns and the manager's house from Green Mountain Energy (100% solar or wind) through Central Hudson. We had installed solar photovoltaic panels on one barn roof 16 months ago, but they don’t have the capacity to supply everything. Assessing carbon storage in trees, which cover more than half our total acreage. On the farm are about 30 acres of woodlands, with most trees less than 60 years old ; about 27 acres of what are now or were in as recently as 50 years ago pasture; and about 4 acres of [barnyard plus building footprints plus farm roads plus stream area]. 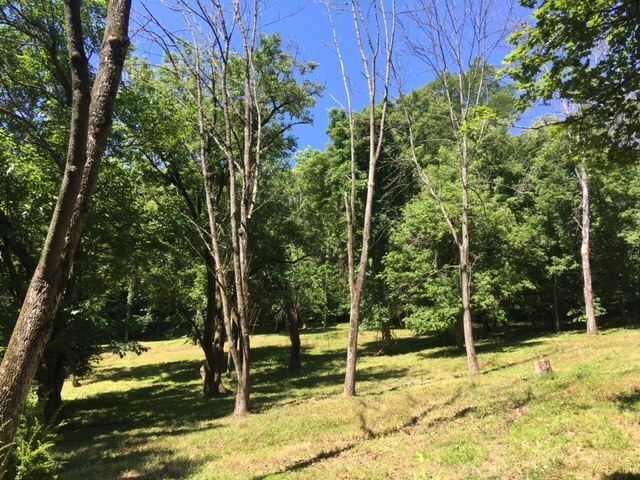 Some erstwhile grazing ground is now practically inaccessible to livestock and has become oldfield which we try to keep mowed amid scores of the stumps and still-standing ash trees finished off by the notorious Emerald Ash Borer. 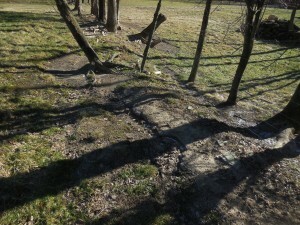 See picture of oldfield, recently mowed, below. 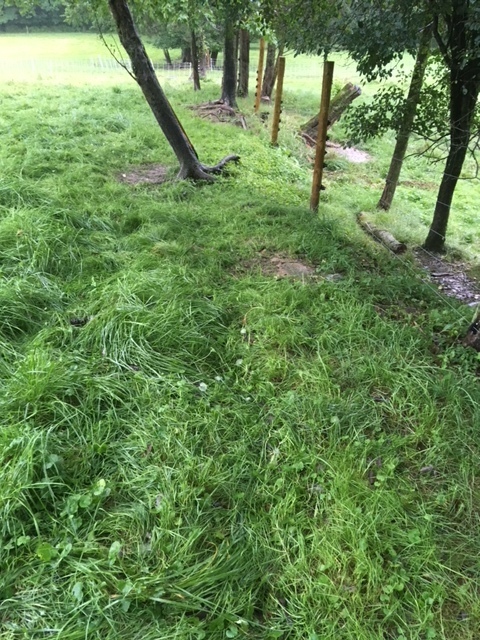 Another four or so acres that we have grazed in the past now have such a heavy growth of Japanese stiltgrass (Microstegium vimineum, an invasive C4 plant) competing with forage grasses that they are hardly worth the work of setting portable fencing The picture below shows stiltgrass on turf that had been grazed up to two years ago. This piece of ground had been mowed twice in 2018 before the photo was taken on Aug 27. 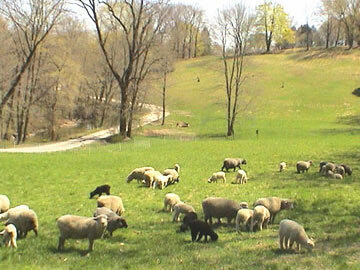 In 2017 . sheep stood at least once on 17 acres of pasture, of which 13-14 acres are decent to good perennial pasture. 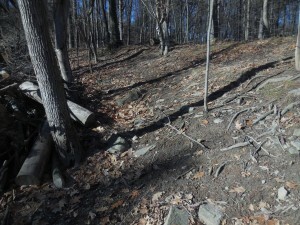 mostly gently rolling hillsides with one relatively steep slope of about 15% . 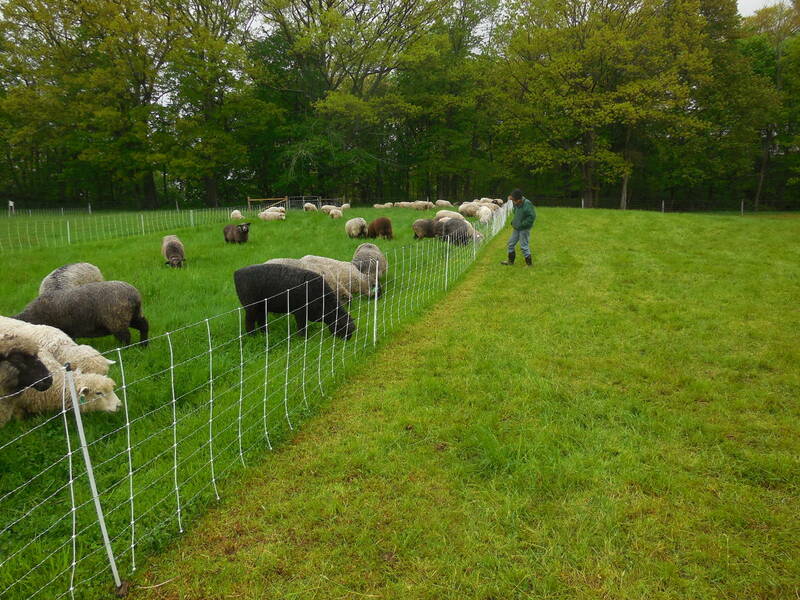 Through 2017 we used semi-intensive rotational grazing for the ewe flock until breeding season, when subgroups stay in larger paddocks for several weeks. In May 2018, before breeding season, we went to more intensive grazing management, aspiring to but falling short of “holistic grazing.” This meant setting smaller paddocks, with average shorter on-times than in the past. Deciding when to open a fresh break was based on a field walk, not a pre-set schedule , but most paddocks were sized to be grazed in about 24 hours. The ultimate in holistic grazing can have a fresh break opened more than once a day. We did this only maybe 5% of the time. Paddocks were bigger on the the third cycle because in a hot dry summer grass comeback was less but was still appreciable after a rainy second half of July. We could not back-fence after every move because there had to be access to shade under trees outside the pasture reached through one of two gates. 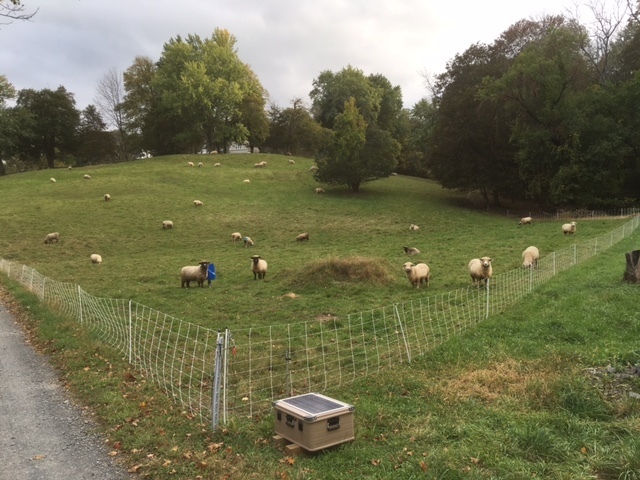 Predictably, however, the ewe mob stayed mostly on the newest break so that ground behind them was pretty much resting even when not fenced off. We have a slide show of the first four months of the new program, but to see it you have to have Power Point. We continued in early 2018 to dress the less steep sward with long-stockpiled barn bedding waste. It’s not optimally aerated but is considered by COMET Farm to sequester carbon in the soil it’s applied to. We don’t employ chemical herbicides. 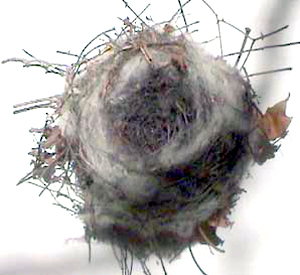 We do use chemical de-wormers regularly as appropriate to age and breeding cycle. 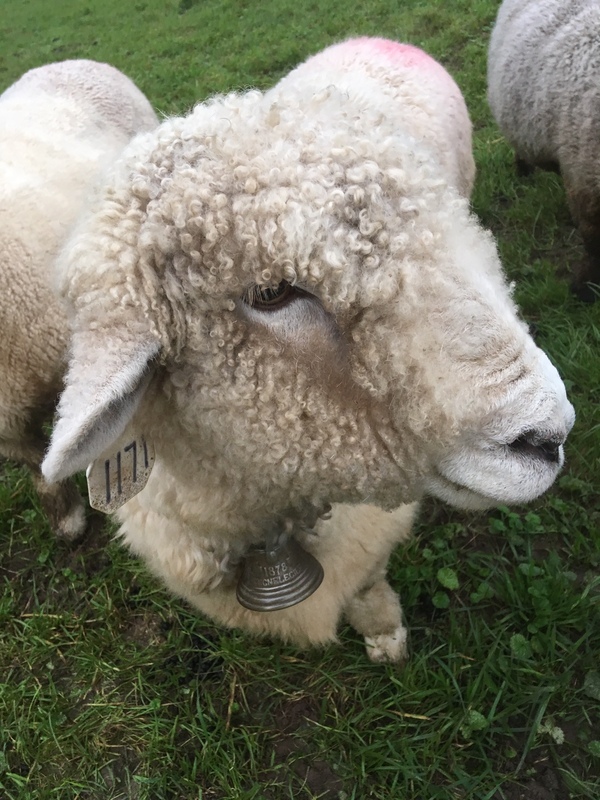 Mature ewes are vaccinated against Vibrio. 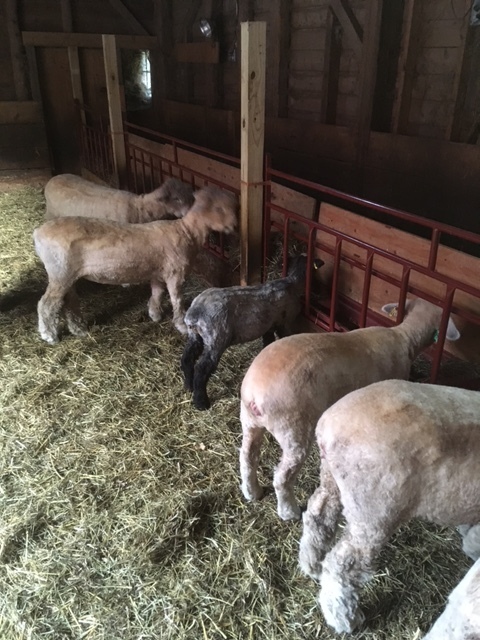 Lambs get lasalocid in their feed to one year of age for control of “coccidiosis.” Other antimicrobials by mouth or injection are given as needed for treatment of symptoms or on schedule as prophylaxis against threats like neonatal pneumonia or chlamydia-caused abortion. Common milkweed is listed as toxic to sheep but we don’t have much growing in the better pastures and if it’s there spare some patches in mowing. We also have hundreds of milkweeds around the house and garden that mature as Monarch butterfly habitat. Our sheep are not interested in eating weeds, not even those such as pinkweed (Persicaria pennsylvanica) said to be palatable to cattle, goats and (friends swear this is true) some sheep. 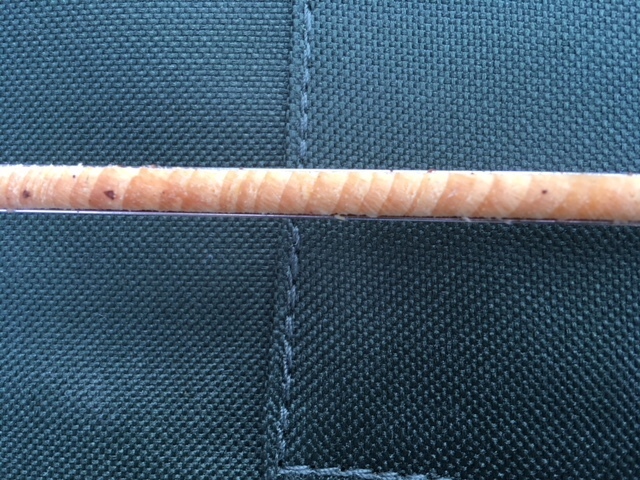 They would eat these, I guess, these if there were nothing else they preferred. The picture shows a stand of milkweed in late August 2018. 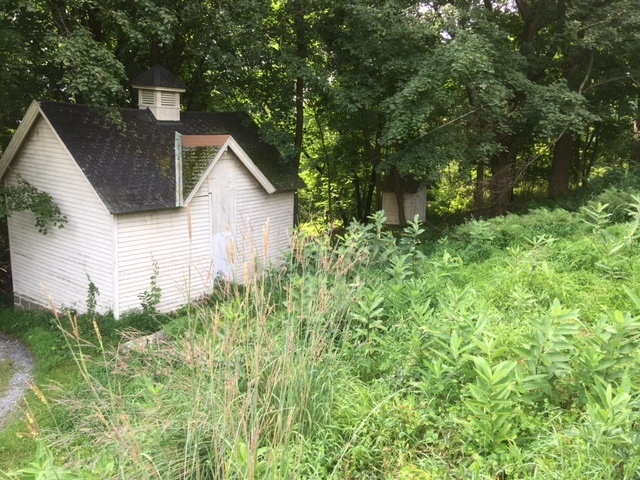 In foreground is Big Bluestem Large structure is an icehouse that no longer stores ice. Small one is not what you think; it’s an old incinerator that now stores paint and fuel. 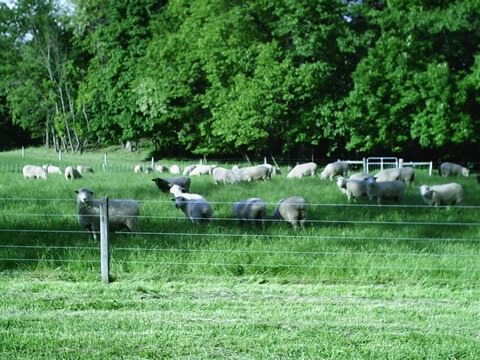 The bank is no longer grazed; it’s very inconvenient to get sheep to it. One way to promote carbon sequestration in soil is to get something — preferably forage, but even tolerable weeds– growing on every square foot of soil. Here are two before and afters that show some success in that realm. In Jan the slope above had been frost-seeded with clover, then had 20 seedlings of common vetch planted in July, There’s not a lot more vegetation to show for it, but there’s some. The next pair of pictures, below, has more dramatic results. The left picture is of the east-west fenceline between two pastures in the North park, almost bare and beginning to gully in January. In summer lambs lounge in the shade along this line under the trees. It was dressed lightly with long-stockpiled barn litter carried by wheelbarrow late winter, frost seeded with clover then scatter-seeded in late spring with annual rye sketchily raked in. What progress has there been on the objectives laid out last year? Assessing our farm’s current carbon footprint (C-print) using our own tabulations as well as USDA COMET-farm; the English counterpart Farm Carbon Calculator; and the Scottish Coolfarm Tool. I have plugged our data into all three of the established publicly available programs as well as our layout cobbled from various sources. The two programs from Great Britain look at a set of variables quite different from ours in the USA and are hard to apply thought their managers have been very helpful. COMET has to date thrown us an un-hittable curve by declaring that mowing pastures even once completely negates any GHG benefits from rotational grazing and spreading stockpiled barn bedding. Stephen does not want to believe but it’s probably true. Certainly making hay removes carbon from soil though some (not all) of that carbon can be recycled by composting manure. 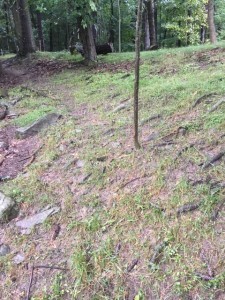 Above-ground biomass cut and left lying will not return its carbon into the soil unless trampled in harder than our sheep do compared to bison or cattle. 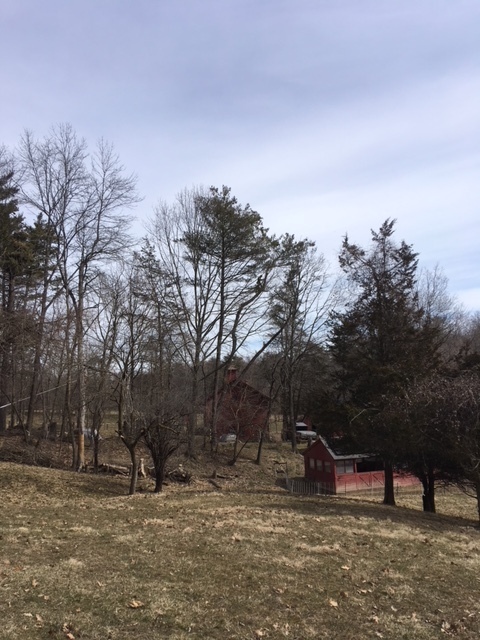 It’s worth noting, though, that if carbon sequestration in our trees is counted, our farm’s CO2 footprint would be negative; probably even the CO2-e footprint would be , too. We have about 7000 trees here. Assuming conservatively that the average one is a 20 year old sugar maple, these are sequestering about 100 tons of CO2/year . We can’t be complacent about the offset and are working to lower CO2-footprint . It looks looks to be about 65 tons CO2/year, but this figure is in flux as I wait for more guidance from COMET in estimating methane and N2O emissions due to enteric fermentation and manure management. A farm’s “carbon footprint” must take these into account, even if that farm does not use synthetic nitrogen fertilizers. Lowering the C-print immediately We now buy electricity for the barns and the manager’s house from Green Mountain Energy (100% solar or wind) through Central Hudson. We had installed solar photovoltaic panels on one barn roof in 2016 months ago, but they don’t have the capacity to supply everything. Jan-July 2018 the panels generated about 1700 kwh. Our new diesel truck gets about 13 mpg where the previous one got 9. 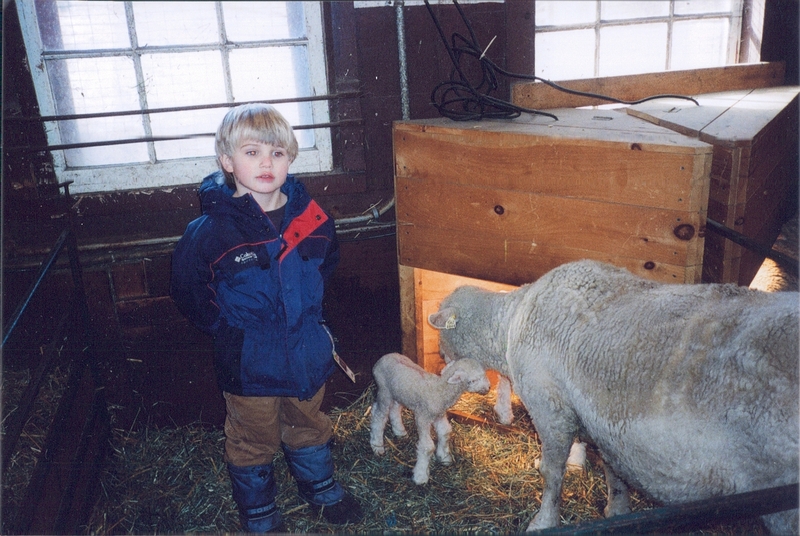 Our ewe flock is about 20% smaller than two years ago; so, grain and hay carriage and consumption are less. Assessing the health of the soil under our pastures by soil samples, soil bulk density testing and forage testing In 2017 we did several score soil and forage tests and one CASH (Comprehensive Assessment of Soil Health). This taught a lot about sampling methods. In a one-line summary, SOM (Soil Organic Matter) was a pleasing 5-6% in most of our pastures and grass clipped from most was 14-15% protein on a dry matter basis. There were problems with soil bulk density testing methods. We used slow air-drying instead of microwave, got some remarkably low numbers ca. 1.2 gm/cc. This needs more work in fall 2018, now ongoing. Assessing the pros and cons of how we compost barn bedding waste and spread what results Good help here from Mary Schwarz at Cornell and the Agro-1 manure lab. Overall, our method (stockpiling barn floor waste uncovered in a wide rectangular pile for 6-9 months without turning) is not optimal, but yields what looks by the numbers useful top-dressing of carbon. 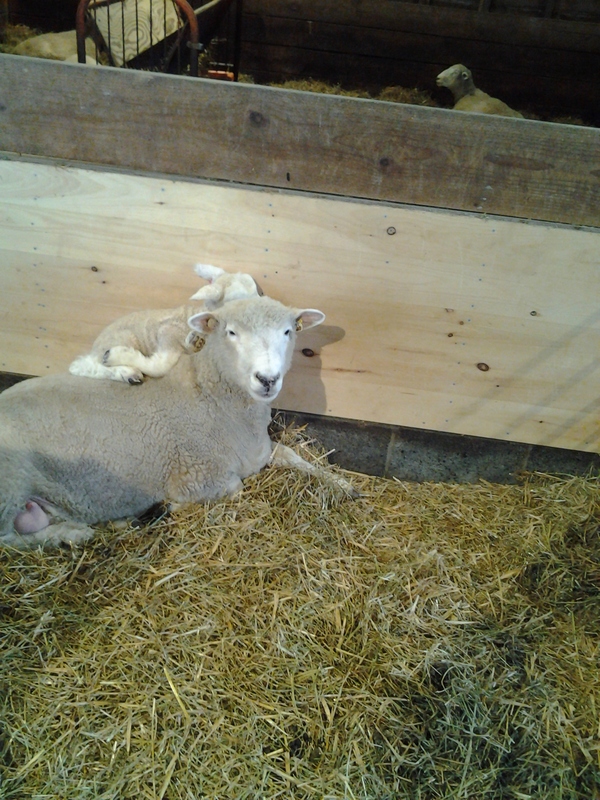 There’s an awful lot to learn on how to use livestock barn floor waste. The secret won’t be in the C:N ratio or the tonnage of organic matter thrown on per acre. The work of Prof David C. Johnson at New Mexico State makes it clear that it’s the ratio of fungi to bacteria in compost that promotes carbon sequestration by mobilizing mycorrhizal fungi around roots. Our anaerobic composting technique will not maximize these good microbes. 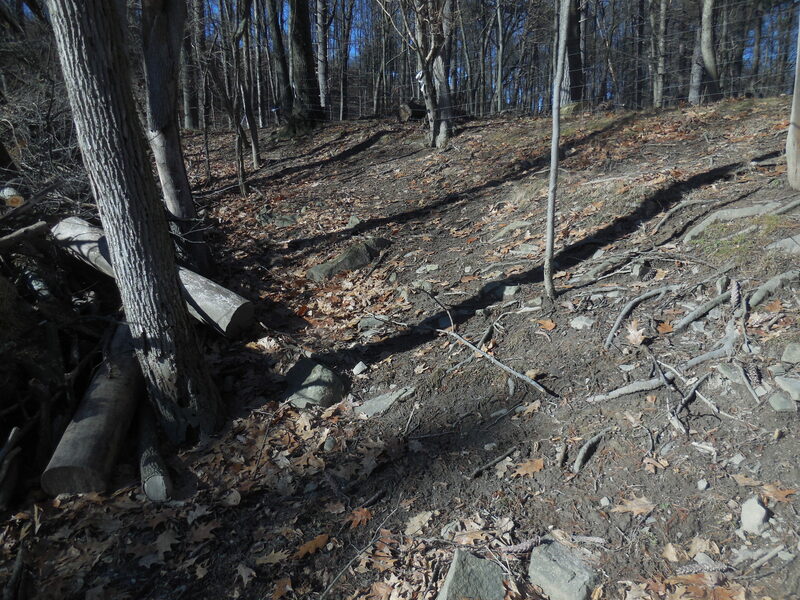 We’ll start using the stockpiled material in heavy applications on small areas rather than light over larger. 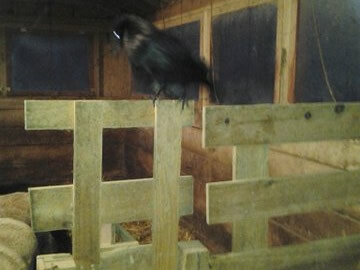 Assessing consequences of manure and urine dropped on the ground I will drop this (pun intended). It may be important for cattle on pasture; they poop out much more and and trample more than do sheep. I suspect sheep manure on pasture gives up its carbon and nitrogen to the air. Assessing carbon storage in trees, which cover more than half our total acreage With the essential help of foresters from The Black Rock Forest Consortium in Cornwall NY we made a start in 2018. The team tallied what species (both native and non-native) are here now, which ones predominate in various mini-locales (limestone ridge, bottomland, waterside) and provided figures to estimate the current carbon storage and the annual rate of carbon sequestration.in the definitely-not-old-growth woods here. We have more than 50 species identified on the place. Norway and sugar maples are the most common species of big tree. Black jetbead (Rhodotypos scandens) is the most common bush that’s more than a foot high. It’s an exotic invasive that we started noticing about ten years ago. I used to pull out a lot of it, thinking it was crowding out more desirable species. Bad idea. It can help to prevent erosion. Moreover, growth of desirable native species is severely limited anyway by deer. The BRF folks had me build two quite small deer exclosures to encourage growth of eastern white pine from seed and protect some black walnut whips bought from a nursery. 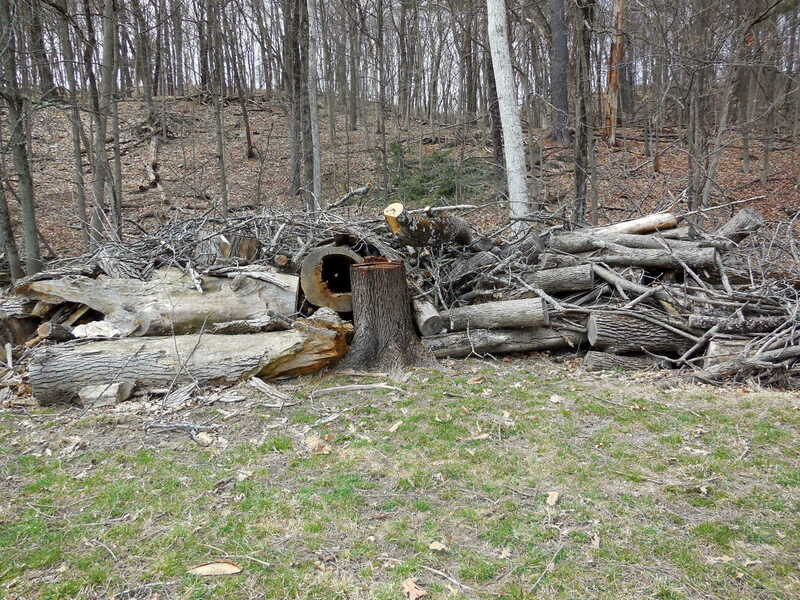 They also advised girdling some Norway maples and ailanthuses to eventually get more light to the understory. That’s not been done as of Feb 2019. 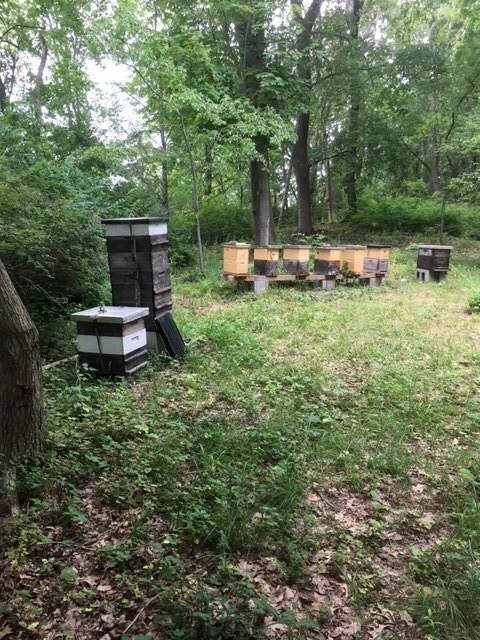 We have also begun efforts to get more deliberate diversity of desirable species into what grows in our pastures. An inventory of what’s there in 2018 is off to a slow start because Stephen finds it so hard to identify grasses despite books, you-tube lectures etc. So we can’t tell you yet what wanted grasses predominate and where but promise to work on it. Identifying weeds in pastures is much easier than differentiating grasses. “I have a little list,” which will become a blog post someday. Weeds, I have learned, can themselves be good for the soil even if sheep don’t eat them, as long as they are mowed before gaining ground, which is easier said than done. We frost seeded very successfully with two kinds of white clover late last winter, not visibly successfully with chicory. We did some small test seedings in May of Ray’s crazy mix, a cocktail from King’s, along with annual rye. We’d like to use more of the Ray’s mix but need a no till drill. 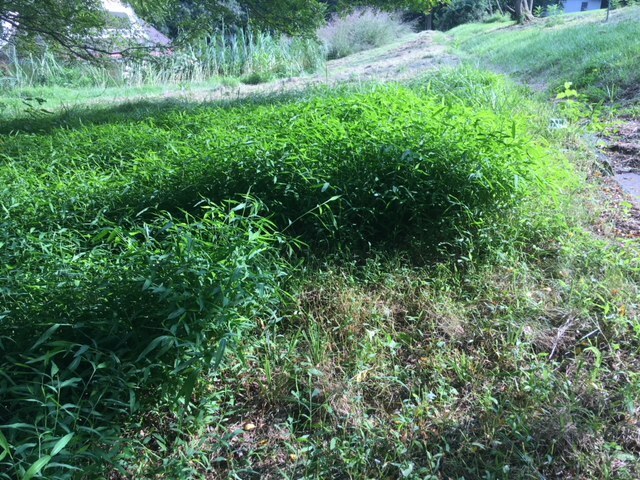 Tried also some plantings of big bluestem and common vetch in trouble spots; can’t say yet if either took well. the big blues are still alive, need a couple of years to take off. In 2019 we have ordered a small no-till drill to put more Ray’s crazy mix into the pastures (if we can get on them in mid-April) and we’ll do more frost-seeding of Alice and Rivendell clover. We will try this year to make fungi-rich soil inoculant in a Johnson-Su bioreactor and use the product after a year as a foliar spray or seed coating. Stephen now thinks that this will be better for soil microbiota than our customary low-rate (1-2 tons dry matter/acre) application of long-stockpiled barn litter. We may use the latter more intensively on smaller areas along with the soil fungi-rich inoculant. biodiversity of flora and fauna is another thing to work on . 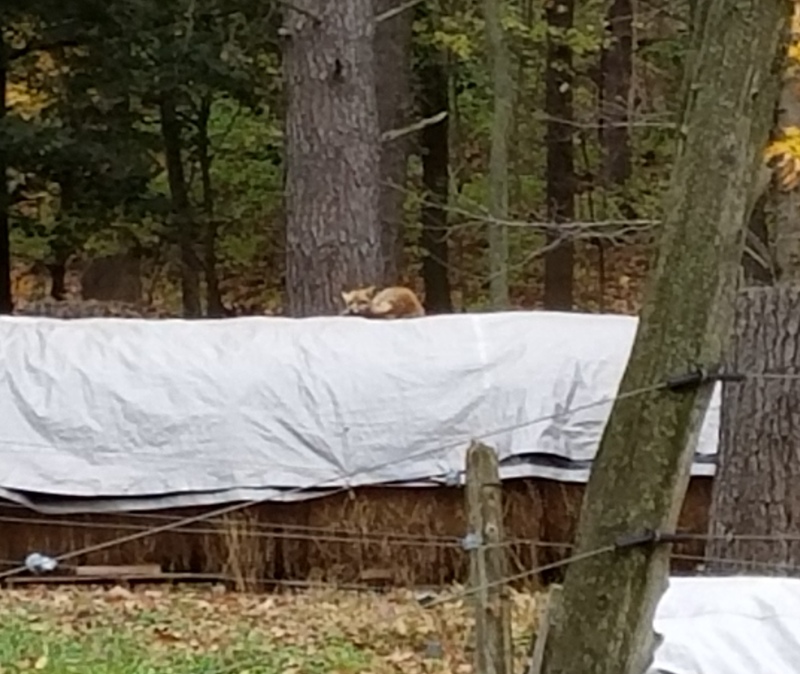 In the last year we as not very keen observers have sighted (list from memory, not a log) beaver, weasel, woodchuck, white-tailed deer (lots), red fox, coyote, gray squirrel, chipmunk, rabbit, skunk, opossum. 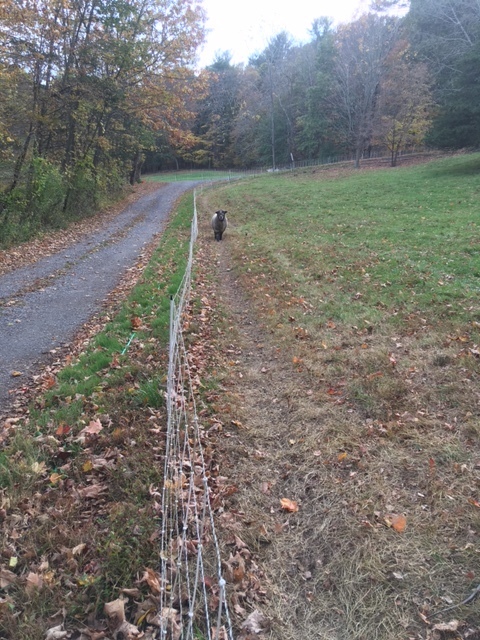 Not sighted, but raided Brian Wilson’s beehives near our front gate, black bear. Snapping turtle , frog, salamander efts, With wings: wild turkey, Canada goose, bald eagle, red-tailed hawk, Eastern bluebird, great blue heron, little green heron, American egret, pileated woodpecker, downy woodpecker, hairy woodpecker, Carolina chickadee, black-capped chickadee, ground dove, nuthatch, cardinal, flicker, bluejay, cowbird (grr! ), grackle, English sparrow (grr,), house finch, robin, goldfinch, crow, tree swallow, American oriole, ruby-throated hummingbird, slate-colored junco, various seagulls et al, mallard, wood duck, turkey vulture, wood thrush. There’s a lot more looking to do. Flying mammals: bats and once, in our house, a flying squirrel. Amongst insects favorites include earthworms, honeybees, ladybeetles, dragonflies, damselflies, butterflies and some outdoor moths like Cecropia. Spiders and bumblebees have their place. 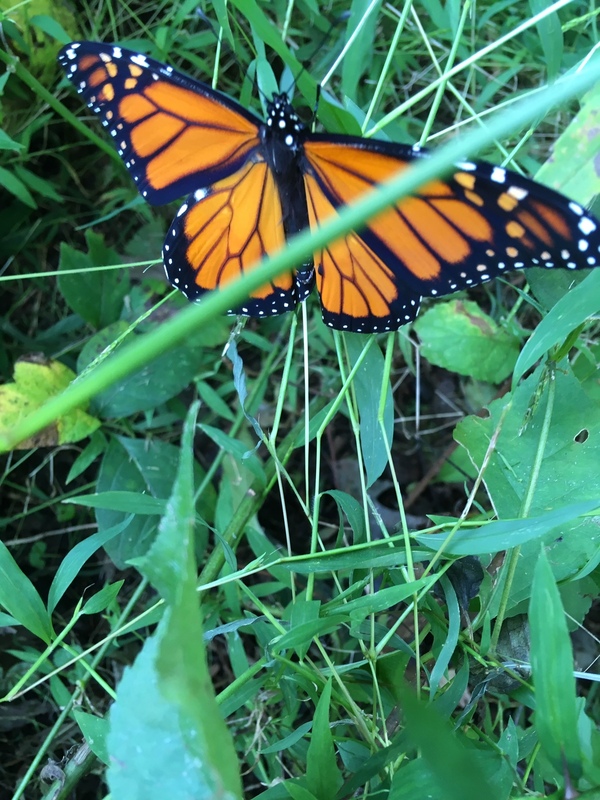 Un-favorites abound, including greenheads, deerflies, mosquitoes, chiggers, stable flies, closet moths, tent caterpillar moths, chiggers, yellow jackets, wasps, brown marmorated stinkbug, I could go on and on and will later. On my bucket list is to inventory plant life beside the trees and to plant more species of trees. In 2018 Stephen wrote a series of blogs about carbon and agriculture that are on the web site under News and Views. Added-to in 2019.